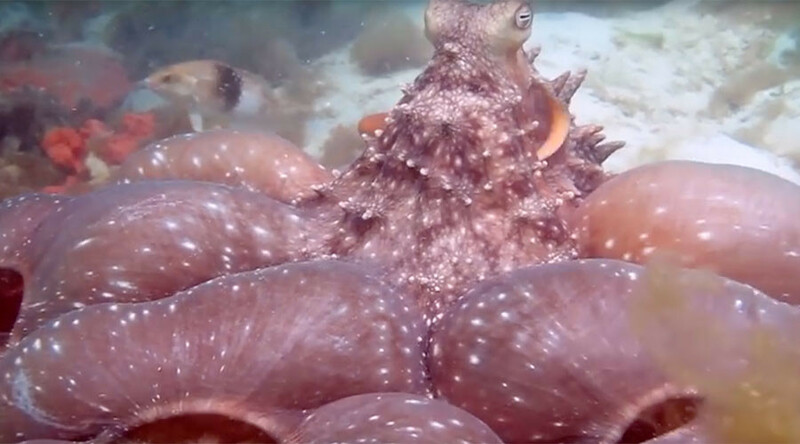 Don’t startle a massive octopus when it’s eating because things could get ugly. That’s the takeaway lesson for a curious diver who disturbed the eight-tentacled mollusk during mealtime, and was quickly chased away. In this extraordinary footage the curious-looking sea dweller, roughly the size of a German Shepherd, puffs itself up as a means of self-defense, warning the diver to stay away. She’s lucky to escape uninjured – all Octopi are venomous and some have been known to be lethal to humans. Elusive creatures, Octopus’s ability to camouflage themselves makes them difficult to film. The stunning footage was captured by a diver in Melbourne, and shows the beauty of the cephalopod and the habitat in which it dwells – before it speeds off into the murky depths.